Stacy Tilton Reviews: They're back: Thanksgiving flavored potato chips! They're back: Thanksgiving flavored potato chips! I've always been one that's open to trying new things. And trying out the limited edition Thanksgiving-flavored potato chips from Boulder Canyon was no different. I was actually really excited when I heard about them. I mean who wouldn't want to try out potato chips that taste like pumpkin pie? At first the flavors might seem a bit strange, but once you've tried them you'll probably enjoy them as much as I have. So far I've only tried the pumpkin pie and the turkey and gravy and thought they were both pretty spot on with the flavors. It was actually quite interesting to see if I could pick out the various spices that would be in pumpkin pie and stuffing as I enjoyed the chips. I'm now looking forward to trying the stuffing and cranberry varieties next. I mean who would I be if I didn't finish off my Thanksgiving meal in potato chip form right? I'm actually thinking about picking up bags of all four flavors to take to our annual family Thanksgiving so everyone else in my family can try them too. Sadly these didn't make it further than a Friday movie night in our house. 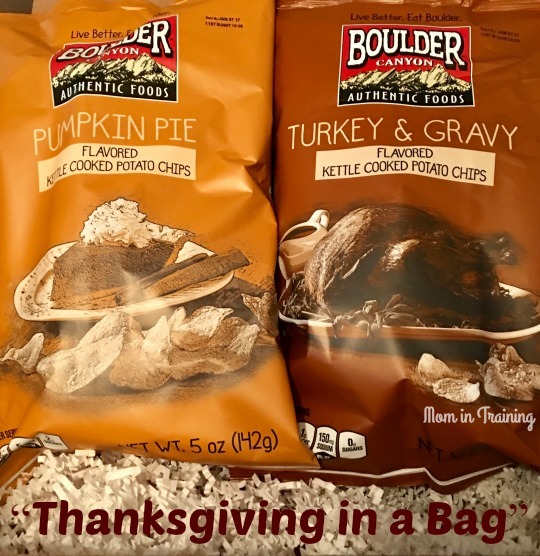 Boulder Canyon, the team that first introduced “Thanksgiving Meal in a Bag”, are bringing back the fan favorites –Thanksgiving-flavored potato chips. Pumpkin Pie tastes just like your family-favorite recipe, while spices such as sage, thyme and rosemary provide the Turkey & Gravy variety with hints of the juiciest turkey and most decadent gravy. Flavors: Stuffing, Turkey and Gravy, Pumpkin Pie, and Cranberry. I need to try & find those Turkey & Gravy chips! Those sound great. Sometimes these flavored potato chips miss the mark. I would try the Turkey and Gravy flavor though! What a great addition for the Thanksgiving Day table. It's a festive snack while the meal is getting finished and served. I didn't see these last year, I'm wanting the turkey and gravy one for sure!